Yet another beauty from the renowned French Jeanneau Prestige line of luxury boats. 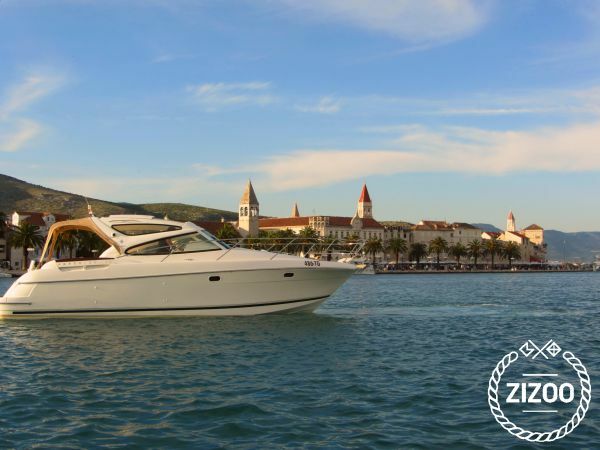 Designed as a small yacht, it is ideal for a family vacation at sea. The spacious, comfortable, safe and perfectly designed interior will satisfy all your needs. The deck can be enjoyed in a number of ways, and the large hardtop offers protection from the sun. Those who love sunbathing will enjoy the large sun deck at the bow. With two 260 HP Volvo Penta Duoprop engines, it provides an excellent combination of comfort and safety under all sailing conditions. The deep V-shaped hull ensures smooth and safe sailing. The spacious cabin with two rooms will satisfy all your needs regarding comfort. The kitchen, the toilet and the dining area with a circular bench make the cabin an ideal place for spending time with your family and friends. Indulge in all the charms of summer while enjoying a perfect combination of comfort and functionality.